Hello paper lovers!! I'm so excited to share with you this release! This month Emma has unleashed a ton of new stamps over at My Creative Time! Didn't you just love what half of the team showed you yesterday! Well today will be no exception. I know that your sock will be blown off my the rest of the team!!! 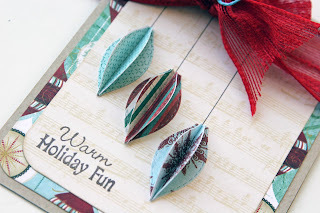 For today's project I get to share with you "Warm Holiday Fun" stamp set! This set is so fabulous, I couldn't just show you one card! I used the ornament die included in the kit to create a 3D card. Don't forget to check out my design teammates over at My Creative Time! This are both so beautiful!!! Beautiful cards! I love the 3d ornaments on the first one especially! That mesh ribbon is gorgeous! Love ornaments! I like that they are 3D. The stockings are so cute. Love ur 3d ornaments. Great ideas!! Thanks for sharing! I LOVE these cards Liz!!! Great idea with using the dies to make 3D ornaments!! Awesome day 2 projects!!! Your cards are so cute, love the bright colors! Liz, your ornament card is absolutely gorgeous! So striking with the 3-D ornaments! And the stocking card... so cute!!! Very very pretty cards. Love the ornament card - that is so clever. The stockings are just too cute. Love how you stamped them around and then did the 3 hangin great idea. Thanks for sharing. Cute cards! I really like the 3D ornament card -- how fun for someone to receive one like that. TFS! I love your cards. The ornaments are beautiful and the stockings are adorable. Thanks so much for sharing! Beautiful cards!!! I love the 3d ornaments and the music sheet background is the perfect touch. Fantastic cards Liz! 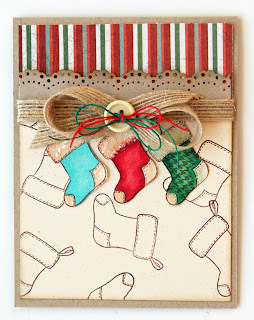 Love the 3-D ornaments and making your own background with the stockings. Great job! Very pretty projects, love the 3D ornaments and the burlap ribbon is fabulous! Have a great day! These cards are fantastic! I love the 3-D ornaments and the stockings are PERFECT! The burlap always looks so fabulous whenever you use it! I just love the 3D ornaments card, and the card with the stocking is super cute. Thanks for sharing these great cards. Those 3D ornaments are wonderful. And that burlap ribbon has been on my wish list for some time. Thanks for the reminder of what a great affect it adds to a design. What great cards!! I love the stocking one!! I'm going to have to have this set!! Oh my these cards are adorable! 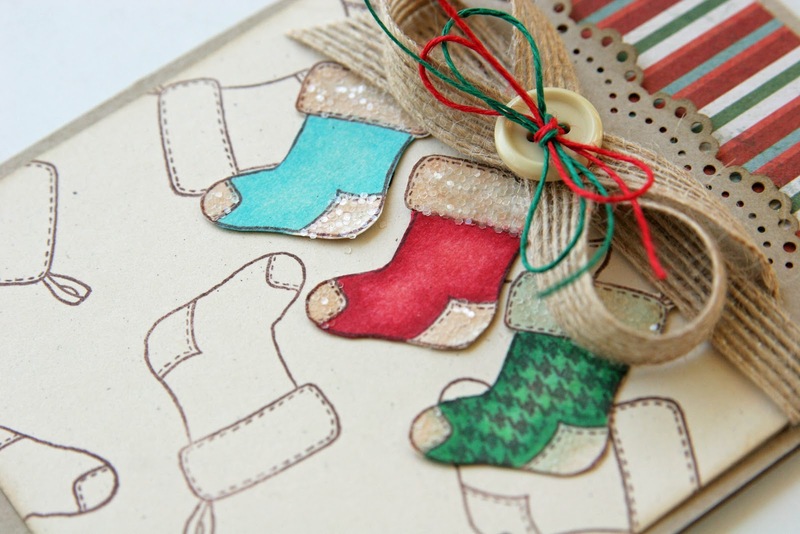 I love how you took the die and made the ornaments 3D and those cute stockings-well they are just to cute for words! Very nice cards. I love the 3D element on the first one. your ornaments are fabulous looks so great! I love the little stocking card!!!! Two great cards. The papers and ribbons are perfect. Great idea to stamp the stockings with build a banner! Those little stockings are adorable!! Christmas is my favorite time of year to craft for... You ladies are getting me SO excited!!! These stockings are hung with care. Warm and festive design. Liz your cards are so gorgeous! I love how you did the 3D ornaments too! That is so cute! You did an awesome job as you always do! :) Have a wonderful day! Super pretty cards!! i love the 3D ornaments, the background on the second card is great!! The 3D ornaments are fabulous. Love the little stockings. Your embellishments are great. Liz I love your cards. They are so cute. TFS. Fabulous cards. That 3-D ornament card is just amazing. Love it! Love the 3D card Liz! Liz ~ Where do I begin with these!!! 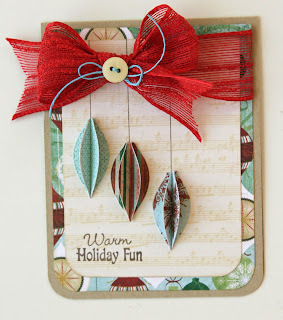 I LOVE, LOVE the 3D ornament card! Not only is it GORGEOUS but TOALLY CLEVER!!! I have to scraplift this!! I LOVE it! Oh the stockings were TOTALLY hung with tons of LOVE too! How CUTE is your background paper!!! You know the details to both of your cards are not only PERFECTLY done but simply BEAUTIFUL!!! Hi Liz, thanks for sharing your card, they are adorable, and I love your 3D ornaments!!! Liz great job in both card. The 3d ornaments look fabulous and the Santa socks. Thanks for share with us! oh my!! I love both of these cards! love how you made the 3d ornaments! Liz your cards are super cute! I love the colors you choose, and your 3D card is adorable. Both are such wonderful cards!!!Lovely!! I love your 3d card. Great job on all of them. I love all your cards but the 3d one is my favorite.! Beautiful cards. Great stamps too. 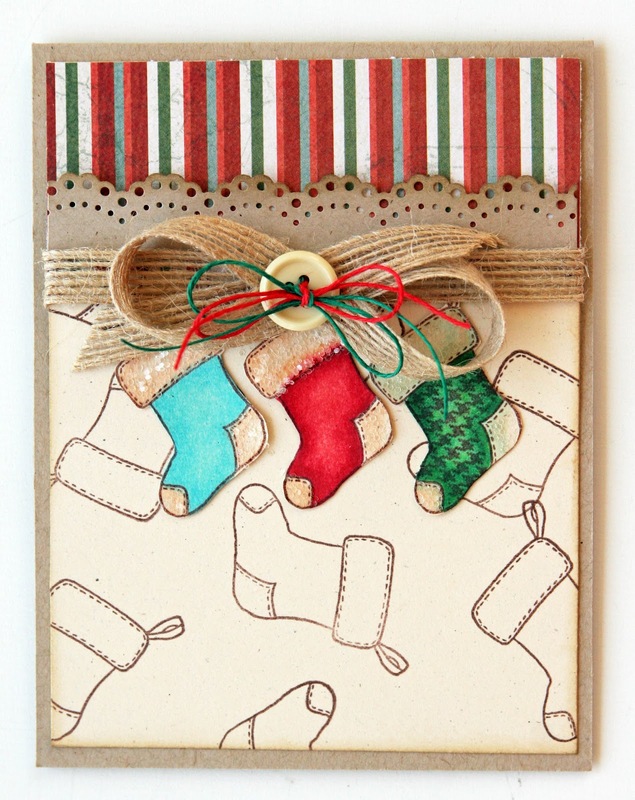 Cute cards, love how you used glitter to make the fur on the stockings. Absolutely gorgeous cards! Love the new dies and stamps. The colors you used are so fun and perfect for the cards! Beautiful cards! Love the 3D ornaments you created! Thanks for sharing. The stamps and dies are a must have!! I love your cards. WOW LIZ!! These are so beautiful!! LOVE the 3D ornament!! That is so cool!! Great job! hugs! Cute cards!!! Thanks for sharing! Love the 3-d ornaments! Really love your cards. The dimensional ornaments are absolutely adorable. 3D ornaments!!! Are you kidding??? AWESOME!!! You are amazing my friend. They look GREAT!!! And your little stocking card I just love. I was so gonna make one of those, but I ran out of time...so glad I didn't because yours is soooo cute!!! Oh wow....I love this!!! The dimension is fantastic and I just love the design:) Great job on both cards Liz!! Sorry I have been a little distant...just running crazy these days! Cute stockings and love the 3d ornaments! 2 great cards Liz. i love the stocking with the cool glitter. Beautiful cards...that 3-D ornament is stunning! Super cute Christmas card Liz! Cant wait to get my hands on this new release..Love your cards, very cute! These stamps are so adorable. Love the 3D ornaments. Liz, you are so clever! Love this idea! Both cards are way too cute! Just wanted to let you know that I love your ornament card! Such a great idea!! Love your boutique also. Very, very cute! I love that 3d effect! Your projects are so creative!